To the south and east is the Atlantic Ocean and to the north and northeast is New Brunswick, and the country of Canada. The Canadian province of Quebec is to the northwest. Maine is both the northernmost state in New England and the largest, accounting for nearly half the region's whole land area. Maine also has the distinction of being the only state to border just one other state (New Hampshire to the west). The municipalities of Eastport and Lubec are the easternmost city and town in the United States. Estcourt Station is Maine's northernmost point and also the northernmost point in the New England region of the United States. Maine's "Moosehead Lake" is the biggest lake that is completely in New England (Lake Champlain is located between Vermont and New York, which is not considered part of New England). A number of other Maine lakes, like as South Twin Lake, are said by Thoreau. Mount Katahdin is both the northern terminus of the Appalachian Trail, which extends to Springer Mountain, Georgia, and the southern terminus of the new "International Appalachian Trail" which, when finished, will run to "Belle Isle", Newfoundland and Labrador. Maine has a humid continental climate (Köppen climate classification Dfb), with warm (although mostly not hot), humid summers. Winters are cold and snowy all over the state, and are mostly more severe in the northern parts of Maine. Coastal areas are moderated somewhat by the Atlantic Ocean. Daytime highs are mostly in the 75–80 °F (24–27 °C) range all over the state in July, with overnight lows in the high 50s°F (around 15 °C). January temperatures range from highs near 32 °F (0 °C) on the southern coast to overnight lows below 0 °F (−18 °C) in the far north. Maine is mostly safe from hurricanes and tropical storms. By the time they reach the state, many have become extratropical and few hurricanes have made landfall in Maine. Maine has fewer days of thunderstorms than any other state east of the Rockies, with most of the state with less than 20 days of thunderstorms a year. Tornadoes are rare in Maine, about two per year, mostly happening in the southern part of the state. In January 2009, a new record low temperature for the state was set at −50 °F, tying the New England record. The state's record high temperature is 105 °F, set in July 1911. A population map of Maine. As of 2008, Maine has an estimated population of 1,321,504, which is an increase of 6,520, or 0.5%, from the past year and an increase of 46,582, or 3.7%, since the year of 2000. This has a natural increase since the last census of 6,413 people (that is 71,276 births minus 64,863 deaths) and an increase because of "net migration" of 41,808 people into the state. Immigration from outside the United States made a net increase of 5,004 people, and migration within the country made a net increase of 36,804 people. The population density of the state is 41.3 people per square mile. The Bureau of Economic Analysis estimates that Maine's total gross state product for 2007 was $48 billion. Its per capita personal income for 2007 was $33,991, 34th in the country. People in Maine produce agricultural goods like poultry, eggs, dairy products, cattle, wild blueberries (the state makes 25% of all blueberries in North America, making it the largest blueberry maker in the world), apples, maple syrup and maple sugar. Aroostook County is known for its potato crops. Commercial fishing, once a mainstay of the state's economy, maintains a presence, mostly lobstering and groundfishing. Western Maine aquifers and springs are a big source of bottled water. Maine's company outputs make paper, lumber and wood products, electronic stuff, leather things, food products, textiles, and bio-technology. Naval shipbuilding and building remain key as well, with Bath Iron Works in Bath and Portsmouth Naval Shipyard in Kittery. Naval Air Station Brunswick is also in Maine, and serves as a large support base for the U.S. Navy. However, the BRAC campaign recommended Brunswick's closing, despite a new government-funded effort to upgrade its facilities. ↑ "Maine - World Travel Guide". World Travel Guide. Retrieved July 20, 2018. ↑ Cobarrubias, Juan (1983). Progress in Language Planning: International Perspectives. Walter de Gruyter. ISBN 9789027933584. ↑ "Legal Status | CODOFIL - Louisiana DCRT". www.crt.state.la.us. Retrieved July 20, 2018. ↑ "French Language - Acadian Culture in Maine". acim.umfk.maine.edu. Retrieved July 20, 2018. 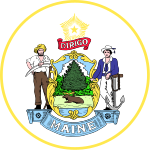 ↑ 6.0 6.1 "Languages in Maine (State) - Statistical Atlas". statisticalatlas.com. Retrieved July 20, 2018. ↑ "Maine DHHS - Multicultural Resources - Interpreting Services& Referral Agencies". www.maine.gov. Retrieved July 20, 2018. ↑ "Maine: Population estimates". U.S. Census Bureau. July 1, 2017. Retrieved May 6, 2017. ↑ "Median Annual Household Income". The Henry J. Kaiser Family Foundation. September 22, 2017. Retrieved December 9, 2016. ↑ "Katahdin 2". NGS data sheet. U.S. National Geodetic Survey. http://www.ngs.noaa.gov/cgi-bin/ds_mark.prl?PidBox=QG1451. Retrieved October 20, 2011. ↑ 11.0 11.1 "Elevations and Distances in the United States". United States Geological Survey. 2001. Archived from the original on October 15, 2011. Retrieved October 21, 2011. ↑ "Title 1, §224: State soft drink". legislature.maine.gov. ↑ Maine does not have an official language. Both English and French are considered the de facto languages of the state. French in particular is legally protected and recognized as Maine's minority language. Maine (along with Louisiana) is considered a part of the Francophone world and makes up the largest French-speaking population in the United States. 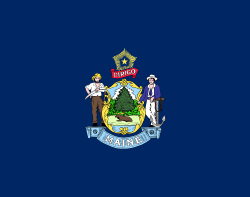 Wikimedia Commons has media related to Maine. This page was last changed on 19 April 2019, at 00:52.